For other uses, see Pin-up (disambiguation). 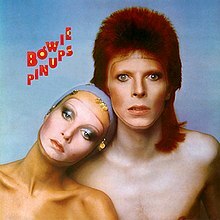 Pinups (also referred to as Pin Ups and Pin-Ups) is the seventh studio album by David Bowie, containing cover versions of songs, released in 1973 on RCA Records. Pinups entered the UK chart on 3 November 1973 (coincidentally the same day as Bryan Ferry's covers album These Foolish Things) and stayed there for 21 weeks, peaking at No. 1. It re-entered the chart on 30 April 1983, this time for fifteen weeks, peaking at No. 57. In July 1990, it again entered the chart, for one week, at No. 52. A version of The Velvet Underground's "White Light/White Heat" was recorded during the sessions. It was never released; Bowie donated the backing track to Mick Ronson for his 1975 album Play Don't Worry. An insert included with the original LP includes the text "This album is called Pinups" and the title is written as one word, without a hyphen, on the LP cover and spine, although the disc label spells the title with a hyphen. According to co-producer Ken Scott, the LP was originally conceived as "a complete opposite of [Bowie's] other albums", consisting of all cover songs except one original composition, and mainly turned towards the US market since "he wanted to do songs that weren't known as well in the States as they were in England", yet eventually the plan was dropped. Pinups was the first of two "1960s nostalgia" albums that Bowie had planned to release. The second, which was planned to be called "Bowie-ing Out," would have contained Bowie covering his favourite American artists, but was never recorded. Bowie also apparently considered making a Pinups sequel: he had compiled a list of songs he wanted to cover, some of which showed up on his later releases of Heathen (2002) and Reality (2003). These songs are among my favourites from the '64–67' period of London. / Most of the groups were playing the Ricky-Tick (was it a 'y' or an 'i'?) -Scene club circuit (Marquee, eel pie island la-la). / Some are still with us. / Pretty Things, Them, Yardbirds, Syd's Pink Floyd, Mojos, Who, Easybeats, Merseys, The Kinks. / Love-on ya! The woman on the cover with Bowie is 1960s supermodel Twiggy in a photograph taken by her then-manager Justin de Villeneuve. It was shot in Paris for Vogue magazine, but at Bowie's request was used for the album instead. Sides one and two were combined as tracks 1–12 on CD reissues. Songs marked with a * were not recorded for the first time by the acts listed, but were popularized by them. Ron Wood – guitar on "Growin' Up"
^ Thompson, Dave (2006). Hallo Spaceboy: The Rebirth of David Bowie. ECW Press. p. 313. ISBN 9781550227338. ^ Perrone, Pierre (16 August 2013). "Cover albums: The best and worst releases in the genre". The Independent. Retrieved 6 July 2015. ^ Lariviere, Aaron. "David Bowie Albums From Worst To Best: Pin Ups". Stereogum. Retrieved 6 July 2015. ^ Eder, Bruce. "allmusic ((( Pin Ups > Review )))". allmusic. Retrieved 15 July 2008. ^ Larkin, Colin (2011). The Encyclopedia of Popular Music (5th concise ed.). Omnibus Press. ^ Wolk, Douglas (1 October 2015). "David Bowie: Five Years 1969–1973". Pitchfork Media. Retrieved 13 January 2016. ^ Christgau, Robert (1981). "Consumer Guide '70s: B". Christgau's Record Guide: Rock Albums of the Seventies. Ticknor & Fields. ISBN 089919026X. Retrieved 22 February 2019 – via robertchristgau.com. ^ Shaw, Greg (19 July 1973). "Pin Ups". Rolling Stone. Retrieved 1 October 2015. ^ "David Bowie: Album Guide". rollingstone.com. Archived from the original on 30 May 2011. Retrieved 13 January 2016. ^ Griffiths, Nick (August 1990). "Stardust Memories". Select. p. 116. Retrieved 11 September 2017. ^ Scott, Ken (2012), Abbey Road to Ziggy Stardust: Off-the-record with The Beatles, Bowie, Elton, and so much more. (1st ed. ), Alfred Music Publishing Co.
^ Kamp, Thomas (1985), David Bowie: The Wild-Eyed Boy 1964–1984 (1st ed. ), O'Sullivan, Woodside & Co.
^ "Image". Retrieved 2 October 2016. ^ a b Phillips, Sarah (16 May 2012). "Justin de Villeneuve's best photograph: David Bowie and Twiggy". The Guardian. Retrieved 8 October 2013. ^ a b c "allmusic ((( Pin Ups > Credits )))". allmusic. Retrieved 15 July 2008. ^ a b "UK Top 40 Hit Database". Retrieved 15 July 2008. ^ "allmusic ((( Pin Ups > Charts & Awards > Billboard Albums )))". allmusic. Retrieved 15 July 2008. ^ Lesueur, InfoDisc, Daniel Lesueur, Dominic Durand,. "InfoDisc : Les Meilleurs Ventes d'Albums "Tout Temps" (33 T. / Cd / Téléchargement)". infodisc.fr. Retrieved 9 April 2018. ^ "French album certifications – David Bowie – Pin Ups" (in French). Syndicat National de l'Édition Phonographique. ^ "British album certifications – David Bowie – Pin Ups". British Phonographic Industry. Select albums in the Format field. Select Gold in the Certification field. Type Pin Ups in the "Search BPI Awards" field and then press Enter. This page was last edited on 23 February 2019, at 01:43 (UTC).